The Expedition theme includes a slideshow for the home page. You can upload up to three images or upload only one. 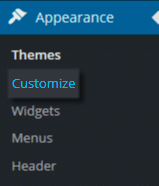 Go to Appearance > Customize > Front Page Slideshow. To set your own images in this area click Change Image button underneath the image. A popup will display allowing you to upload the image of your choice from your computer (We recommend horizontal or landscape images that are at least 1920 pixels wide), or to find one directly in your Media Library.